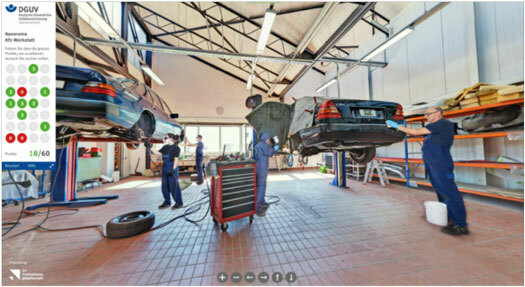 (Nanowerk News) Nanomaterials and ultra-fine particles in car workshops - learn how to handle them safely by exploring the "Nanorama Car Workshop", which is now available (in German) at http://nano.dguv.de/nanorama/bghm/. A "Nanorama" is a virtual classroom that allows its users to gather important information on safe handling of nanomaterials in a 360° work environment. The emphasis of the "Nanorama Car Workshop" is on the handling of products containing nanomaterials and on work processes that can lead to the formation of ultra-fine particles. In the "Nanorama Car Workshop", the user receives useful information about hazard evaluation assessment, the occupational exposure to nanomaterials and necessary protective measures. The "Nanorama Car Workshop" is part of the Nano-Platform "Safe Handling of Nanomaterials" by the German Social Accident Insurance (DGUV). It was developed by the Innovation Society, St. Gallen in cooperation with the German Social Accident Insurance Institution for the woodworking and metalworking industries (BGHM). Dipl.-Ing. Klaus Ponto, Head of Expert Committee Woodworking and Metalworking of the DGUV, is convinced that "the "Nanorama Car Workshop" is particularly convenient to sensitise and educate young workforce and apprentices on the safe handling of nanomaterials and ultra-fine particles". Dipl.-Chem. Michael Rocker, Head of the Subcommittee Effects upon Health and Media BGHM, who was also involved in the development of the "Nanorama Car Workshop", agrees. "The special convenience is owed to the pleasant design, the high frequency of interaction and its time- an place-independent availability", he adds. With the launch of the Nano-Platform "Safe Handling of Nanomaterials", the DGUV has introduced the world's first interactive platform focusing on occupational safety and health aspects of nanomaterials. "Nanorama", devised by the Innovation Society, St.Gallen, build an essential part of the platform. So far, three "Nanorama" have been published: The "Nanorama Construction" and the "Nanorama Lab" were developed in collaboration with the BG BAU and the BG RCI. They focus on the safe handling of nanomaterials on building sites and in laboratories, respectively. Due to its modular design, the Nano-Platform can be expanded with further "Nanorama"-modules on any given sector or trade.